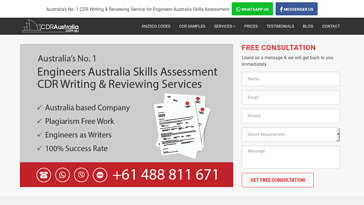 CDRaustralia is an academic help site that specialises in CDR reports and provides assistance for writing their CDR and documents related to it. Since writing a CDR is articulately crucial to be able to obtain a Migration Skills Assessment Certificate. Most engineers often find it difficult to draft a CDR report properly, and that is why they opt to take CDR report writing help from a reliable company that provides professional aid for writing a report. According to CDRaustralia.com.au, the company delivers well-structured CDR reports. The company also claims that they deliver plagiarism free CDR reports and the experts make sure that the career episodes for every individual are customised according to his/her qualifications and field experience. 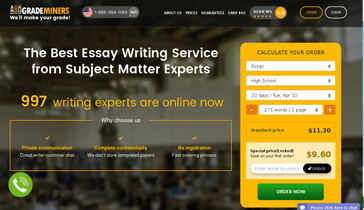 As per the website, they have a team of highly qualified writers who have an expertise in CDR writing. The experts promise to make sure that the content delivered is based on the professional and personal details provided by the client. They also offer CDR proofreading services that one can avail to get the CDR reports checked. The company asserts that the summaries and career episodes they deliver are always free of errors. The company also claims to provide assistance for Stage 1 and Stage 2 competency assessments to engineers who aim to obtain the Skills Migration Certificate. They provide three packages – the normal package, the fast package and the express package. The pricing scheme differs with the deadline and the quality of the CDR ordered. Deadline is a significant factor that determines the rates – the shorter the deadline period, the higher the rate. The minimum rate for a CDR report starts at 699. In case of a CDR plagiarism check, one can get a quote from the website. The website does not provide any discount or rebates, nor do they have any referral programs for their customers. Most of the time when a customer agrees to use the services of the CDRaustralia and pays for the same, there will be no money back or refund for the payment. Since they assure excellent customer experience and satisfaction, they provide a refund only when they feel that the client’s claim is justified. The decision rests strictly at the company’s discretion. As per the website, they assert that they are not liable for any refund in case the customer complains regarding choosing the wrong service. There will be no refund of any kind in instances where a customer decides not to use the service after making the payment. They also mention that the company always take the final decision related to each and every concern about refund. Along with these, the company also claims to provide 24/7 customer chat support via call as well as messages. So if a client has any problem, he or she can immediately reach out to the company for queries. Going through the website, one will find that CDRaustralia.com.au has positive reviews mostly. There are no mentions of scandals or fraud activities in the reviews of the customers that one needs to be aware of. Apparently, the website has no issue that can makes it look like a fake company that offers fraud services. The pricing system of cdraustralia is exceptionally inconvenient. They charged heftily to write my career profile assignment. I have never encountered a company with a pricing system as awful as this one. Neither did they offer me any discount, nor did they provide me with a refund. You should definitely stay away from this one. The RPL report they delivered did not include essential elements. Now I have to do it all by myself. I had to postpone my immigration date for the same. I cannot believe that they can easily sabotage a person’s career. I hired cdraustralia.com.au to write my CV. I was unsatisfied with the paper and I requested them to make changes. I tried contacting them numerous times. I called them at the contact number and dropped emails. Neither did they respond, nor did they change the CV according to my requirements. I seriously lost faith in their services.